I celebrate and re-interpret long established customs with performance, print & video. My practice deals with ritual, tradition and craft. Slavic rituals and traditions were often the starting point in my work. As a UK-based Czech artist living with my young family in Birmingham I also feel the need to explore other European customs and rituals. After researching how people faithfully practice their traditions and rituals I then reinvent them with my collaborators and local communities. Among many others actor-writer Zoe Simon and cellist-composer Bela Emerson have continuously contributed to realizing and re-interpreting my vision. My latest project sought to revive an ancient and almost forgotten English tradition: Clipping the Church. In times past families would flock to encircle local churches, holding hands with each other to literally surround the church with open arms. This custom brought families and communities together in times past and which I brought vividly back to life at the St Barnabas Church in Erdington, Birmingham, in June 2016. 200 people were present at its enactment 13 days pre-Brexit on 11th June 2016. As a potent symbol of identity and belonging, this artistic project renewed ties with a disparate community; this was a public art project that not only brought hundreds of people together, but also invited a reflection on the changing nature of family life and an opportunity to join a wider community by harnessing the customs of the past. Tereza Buskova (b.1978, Prague) is a Czech artist who lives in Birmingham with her young family. She completed her Fine Art Printmaking MA at the Royal College of Art in 2007. Since her graduation from the RCA Buskova has been exhibited by David Roberts (Rituals, 2008), Anita Zabludowicz (A Tradition I Do Not Mean To Break, 2009), the Newlyn Art Gallery (Rituals Are Tellers Of Us, 2013) and the Whitechapel Gallery (Reality Czech: the Czech Avant-Garde,2015). 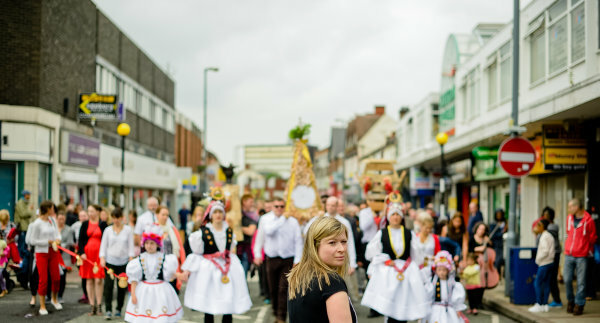 She has exhibited, performed and lectured in a broad range of different spaces including Lincoln's Chambers Farm Wood 2010, Kunstnernes Hus Oslo 2014 and Erdington High Street (Clipping the Church, 2016).